Our team development is focused on partnering with leaders looking to build strong, cohesive teams. Teams succeed when the leaders are not afraid to course correct, make difficult decisions, and focus on continually improving to meet today’s changing workforce. Building effective teams differentiates leaders from managers; Leaders embrace their ability to master their relationships with their people. One of a leader’s fundamental requirements is knowing and understanding their people, their strengths, and their uniqueness’. Our process begins with meeting with the leader(s) as well as the team members. We work to develop specific solutions or customize existing offerings that focus on building trust, addressing conflict productively, while building commitment, not consensus. We lay that foundation and navigate their ability to be accountable, which produces results. We also integrate assessments that help teams effectively understand what it takes to be a cohesive group of team members. 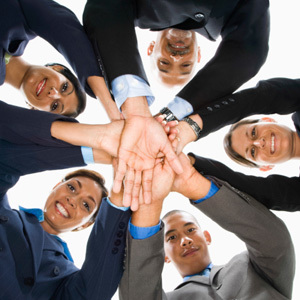 See DiSC Solutions, 5 Behaviors of a Cohesive Team. We partner with leaders of newly formed teams, intact teams, cross-functional teams or teams facing change in today’s workplace. THE FIVE BEHAVIORS OF A COHESIVE TEAM is an assessment-based learning experience built on Patrick Lencioni’s book Five Dysfunctions of Team. The work in this program helps individuals and organizations reveal what it takes to build a truly cohesive and effective team in the most approachable, competent, and effective way possible. Powered by Everything DiSC®, the profiles help participants understand their own DiSC® styles. Bringing together everyone’s personalities and preferences to form a cohesive, productive team takes work, but the payoff can be huge—for individuals, the team, and the organization. In this interactive workshop, participants will identify the stages of team development and their impact on performance. During this workshop, participants will work in various teams to identify team successes, developments and personal commitments they will integrate back in the workplace. The workshop will focus on what team members need from each other as well as personal accountability to ensure the team’s success. Does your workplace have multiple business units or “silos”? Does the organization experience conflicting goals and objectives among business units? How effective are the relationships between business units? In this experiential, interactive workshop, participants integrate relationship building with members within and across the various business units in your organization. They will identify how we observe, receive and interpret information and how our perceptions impact our relationships and view of our customers and fellow team members. Through various team activities, participants will explore the value of successful communication, building trust; promoting problem solving that reinforces the importance of focusing on the external competition, and not each other.